Windows Vista will be released later this year to partners and volume license customers and in the beginning of 2007 to the masses. A successful release of a software product such as Windows Vista requires that a lot of consultants use it and can recommend it to the companies. The last few days it has come out in the open that Windows Vista will not support Microsoft Visual Studio 2005 until the first service pack is released, during the first half of 2007, and even then it will be compatibility issues. Visual Studio.NET 2002 and 2003 will definitley not be supported on the Windows Vista platform! I think this is outrageous, and I'm not alone! Visual Studio.NET 2003 is one of the most used development platforms today, and the lack of support for it in Windows Vista will result in that a lot of developers will not use Windows Vista as their primary development platform. Of course you can use Virtual PC or Virtual Server on Windows Vista and have all of you development done in them. But this requires that you have a good hardware platform and makes the development more lengthy. I really want to use Windows Vista on my development machine and therefore I ask Microsoft to tell us exactly what is not supported when using Visual Studio 2005, pre and post SP1 and what exactly is not supported when using Visual Studio.NET 2003. Sure, I can try it for myself, but that will not calm my clients nor myself! Last week I met with a company that the next year will change/upgrade their whole PC platform, more than 1.000 PCs, and they will probably not go with Windows Vista directly and they will definitly not go with it if not their suppliers and consultants don't. I ran into some problems, that I thought I would share - with the reason, on one of our Virtual Server 2005 R2 machines, running Windows 2003 R2. We had problems copying files to the machine and recieved Delay Write Failed application popups, and it recorded the following event in the Event Log. Event Type: ErrorEvent Source: DiskEvent Category: NoneEvent ID: 11Date: 9/26/2006Time: 1:30:05 PMUser: N/AComputer: SERVERDescription:The driver detected a controller error on \Device\Harddisk1. The reason for this was that the Virtual Server host disk was running out of space and the harddisks were running dynamically expanding virtual disks. Windows Vista startup sound finally optional! The Windows Vista team has listened to the community (read my previous post on this) and included the option to mute the startup sound of Windows Vista. And also there are a new build (post RC1) out for Windows Vista available for download for a limited time, but beware the build is not that thorouglhy tested as the RC1. I have been running Microsoft Outlook 2007 Beta 2 Technical Refresh now for a while and it's a great improvement to the Beta 2 but. There have been a lot of changes to the user interface in this release. One thing that annoys me is the location of the Send button in a mail that you are composing. The most natural place should be where the Paste button is placed today. 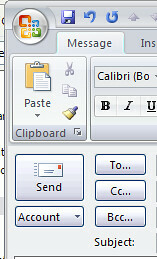 My suggestion is to insert a slot for the Send button to the left of the Clipboard in the Ribbon bar. I recently ran into a problem where I had by mistake checked the Remember password checkbox in Internet Explorer 7 (RC) when visiting a NTLM based website, then I wanted to get back to use my currently logged on user to access this website. There is no way to clear these usernames and passwords using the standard ways in Internet Explorer. First of all I tried to turn off the Automatic logon only in Intranet Zone and entering a new but faulty password for the user and checking the remember password checkbox. This cleared the old password but after resetting the automatic logon Internet Explorer always asked for my password for that site and I didn't want to enter my current logon information and save the password (this would only ask me for a new password whenever I change it). After some searching on the Internet I found no other solution than the one I tried above. But after digging into the problem for some time I found out where Internet Explorer 7 RC stores the cached credentials. They are stored in file (Documents and Settings\\Application Data\Microsoft\Credentials\SID>\Credentials) that I removed (of course after making a backup). Then I rebooted the computer and the automatic logon worked fine. If you are interested in what usernames and passwords that are stored on your machine you can check out Nir Sofers Password Recovery Utilities. I'm so happy, the DSL Tools V1 is shipped as a part of the Microsoft Visual Studio 2005 SDK V3. I've been waiting for such a long time, now we can finish up our designers and make them available to our developers, partners and clients so they will be able to develop more easily. I'm currently downloading it, so I'll have to see how much has changed since the last beta version, hopefully not that much. The Microsoft Visual Studio 2005 SDK Version 3 can be donwloaded from the VSIP Program site. With this download (available in English, Japanese, French, German and Spanish) you can open, edit, save and create Microsoft Office 2007 files using Microsoft Office 200, Microsoft Office XP or Microsoft Office 2003. Great, this makes it more easy to deploy Microsoft Office 2007 within an organisation. This morning, we announced that starting tomorrow (Thursday, Septemeber 14) you'll be able to download the Beta 2 Technical Refresh build of Office 2007 (build 4407.1005). Stuart Kent announces that the documentation for the DSL Tools version 1 are available at MSDN. We're getting closer to a final release of the DSL Tools. I can't wait to get my hands on it! XML Notepad 2006 - what's the fuzz about? There seems to be some kind of software release frenzy at Redmond right now. Microsoft are spitting out application after application and I don't mean the two huge ones; MIcrosoft Windows Vista and Microsoft Office (Server) System. Applications, small and big, like Internet Explorer 7, Windows Live Writer, XNA Game Studios, different Microsoft Live applications, Windows Desktop Search and now XML Notepad 2006 are dropping out from the software factory. It's fun, but it takes me so much time reading and catching up on the releases. Ok, this looks fine at the first glance, but what I really wanted was a structured XML tree view with some kind of synchronized XML-source view. If you try to view the source then it just fires up Notepad. I think the current Tree View of XML Notepad 2006 with just the XML node text''s are pretty useless. I work a lot with XML documents of all types and usually use Visual Studio 2005 (or the Express products) to edit them, it works fine and I think I will still use VS2005 to edit XML documents or plain ol' Notepad. It's not all bad, it can be a good application if this is adressed as well as an intellisense based XML source editor. If I see to myself I find it somewhat easier to work with a text editor, but having the tree view at hand will allow me to navigate through the documents faster. You should give it a try and download it here. , because I wanted to test Windows Live Writer. As I posted before the current implementation of the Metaweblog API by WLW is not correct in the beta. According to the WLW newsgroup, on this issue, the team are taking a second look at the Metaweblog specifications. Funny thing is that WLW does not even follow the specifications found at MSDN. The big problem is the metaWeblog.getCategories method which should return the categories of a specific blog. The response should, according to the Metaweblog specs, contain description, htmlUrl and rssUrl, but Windows Live Writer wants a response with categoryid and title. It seems like all of the different blog providers implemented by WLW has this issue; Movable Type (mt.getCategoryList expects categoryId and categoryName) and even Windows Live Spaces (which uses the metaWeblog.getCategories). Today I got a comment on a previous post from Michael Ekegren who also stumbled upon the same problem as I did. So, if you would like to use WLW to your own homebrewed Metaweblog API, you have to return a response like this to the metaWeblog.getCategoris XML-RPC call. Disclaimer: This is just how I got it to work on the current beta of Windows Live Writer and this will probably get fixed in the future and it is not the way it should be done according to the Metaweblog specifications. 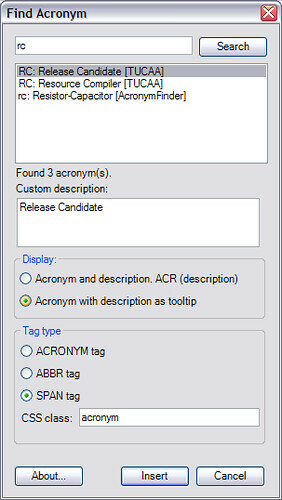 The Acronyms plugin for Windows Live Writer has been updated. The plugin now contains more customization on how to generate the markup when publishing the post. You now have the option to use either the span, acronym or abbr tags. DSL Tools version 1 soon here! Finally! According to Stuart Kent, program manager at Microsoft, the DSL Tools V1 will be a part of the Visual Studio 2005 SDK Version 3 at the first part of september. I have now a long time waited for this release so we can build our own designers for Visual Studio 2005. Currently my company have a huge demand from our customers that our application should be more easily customized, and the DSL tools will really help us out. I have been trying the CTP's for DSL tools throughout this last year, and I have big hopes for this part of the SDK. The CTP's required a lot of XML editing and some really hard-to-understand error messages. So, let's wait a few more weeks and see what the DSL team has come up with.